Stainless steel rope mesh is made from high tensile stainless steel 304, 316, 304L and 316L. 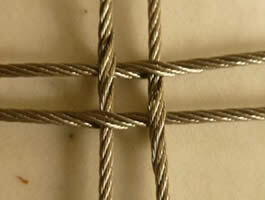 The stainless steel rope construction is 7 × 7 or 7 × 19, and 1 × 7 and 1 × 19 are also available. Stainless steel rope mesh can be divided into two kinds according to the combination method: stainless steel knotted rope mesh and stainless steel ferrule rope mesh. The former is combined by the ropes winded together. And the latter is combined by the ferrules which are made up from the same grade stainless steel. Except the two main products mentioned above, we also supply stainless steel square rope mesh and anti-theft backpack protector. The stainless steel square rope mesh is mainly used as stainless steel decoration rope mesh because of its beautiful square holes. 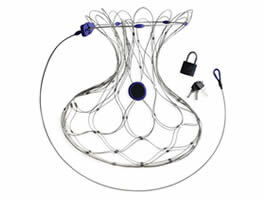 And stainless steel rope mesh anti-theft backpack protector can protect your valuable bag or luggage from being stolen. 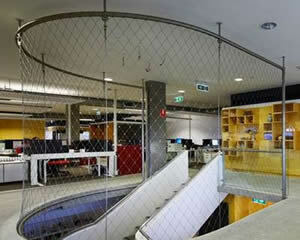 Stainless steel rope mesh has diamond holes and aesthetic appearance, making it suitable for decoration. The rope diameter, opening size and mesh size can be modified according to customers' requirements. Stainless steel rope mesh is soft, so it will not hurt hands. Meanwhile, it has high strength, so it can bear heavy snow, rain and gale. The rhombic holes allow enough light to enter, making the rope mesh has good perspectivity. Stainless steel rope mesh is made up of high quality stainless steel ropes, so it is resistant to rust. Its service life is more than 30 years. Besides, it does not require maintenance. It can keep the original color and shape many years later. 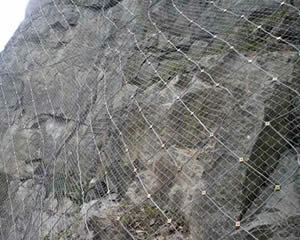 Slope protection rope mesh has enough intercept strength to prevent the rocks from slope falling onto road, railway, expressway or other structures. Instead, rocks will fall to the foot of slope behind the rope mesh. Stainless steel rope zoo mesh has diamond-shaped openings and high strength, which can protect visitors from being damaged. 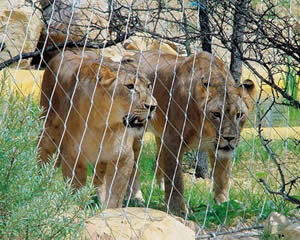 Therefore, visitors can enjoy the animals at a close distance free of danger. What's more, it can protect animals from being hurt. 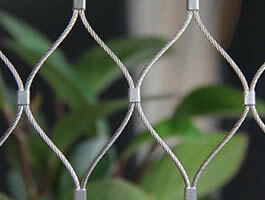 The mesh size and opening size of stainless steel rope mesh can be modified. 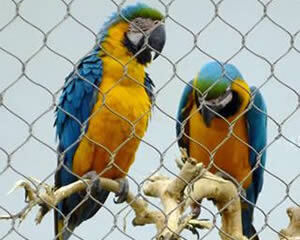 So it can provide enough space and create a natural environment for birds to make them live comfortably. 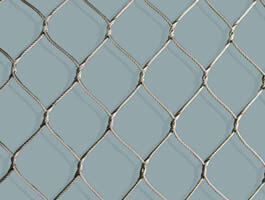 Stainless steel rope mesh is resistant to corrosion and rust even though it is exposed to sun directly. And it can make the green wall with green plants. 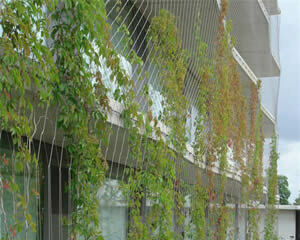 Green wall can regulate the temperature of the building and it can protect the building wall. The diamond-shaped holes make the stainless steel rope mesh have aesthetic appearance, so rope mesh can be used for decoration of building, such as ceiling and curtain wall. 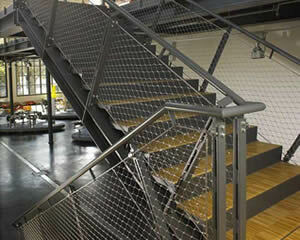 Stainless steel rope mesh is also used for the balustrade of stair or balcony. It can make the stair grand, beautiful and safer. 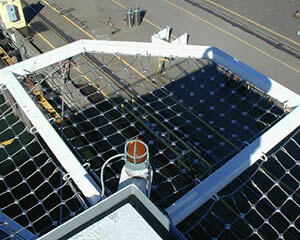 Stainless steel rope mesh can ensure the safety of helicopters and passengers when it is used as the helideck mesh. It is installed around the helicopter landing deck. 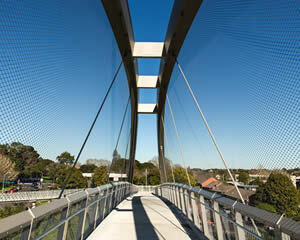 Stainless steel rope mesh is also mainly used in the suspension bridge railing. It can increase the safety performance of suspension bridges and ensure the safety of passers. Ferrules combine ropes firmly to make the mesh a whole, so stainless steel ferrule rope mesh is resistant to impact and fatigue for green wall and balustrade. Stainless steel knotted rope mesh has good visibility for its diamond openings, so it is widely used as animal cages, animal fence and bird cages. Anti-theft backpack protector is made of stainless steel rope mesh, so it can reduce the risk of backpack being stolen to a large extent. Stainless steel square rope mesh can keep its original appearance and shape, maintain free, widely used for animal enclosure, bird cage and decoration.